Painting is something that can be done without having a ton of skill and practice, but the trickiest part of painting is keeping your lines straight along the ceiling. I’ve done a lot of painting and tried a lot of different techniques for edging. It takes a lot of practice to be able to freehand straight lines, so I don’t recommend free-handing it if you are an inexperienced painter . You can tape it off, but it is a tedious process that I loathe, so I try to avoid it at all costs. Besides, even after you’ve gone to all that effort, sometimes the paint will still bleed under the tape anyway, or worse, when you take the tape off, chips of paint might come off with it. That is aggravating to say the least. I have tried using the Sure Line Paint Edger tool and it works okay at first, but it gets gunked up fast and the lines stop being straight. 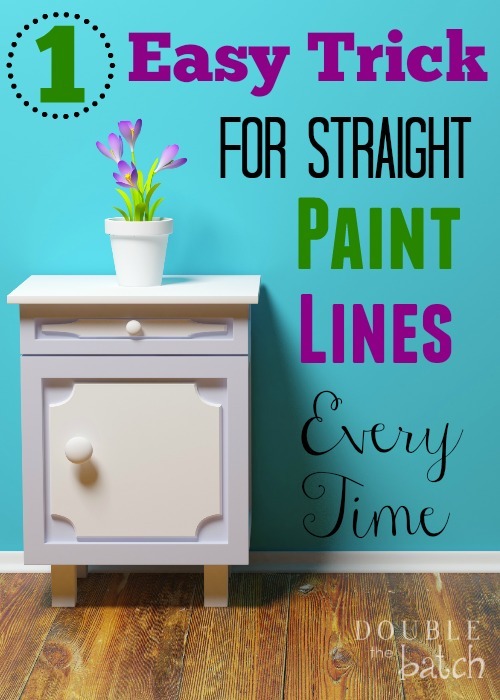 So, when a friend taught me this easy technique to make my paint lines straight I was thrilled! Anyone can do this and get great results. You will need a 10 or 12 inch drywall knife like this, and a short roller like this with a 4 or 6 inch roller cover like this. Do not use a sponge roller cover (they tear and don’t cover well) or a really thick roller cover (more likely to give you rougher edges.) The one I’ve linked to is the best. It needs to have the plastic piece on the end to have the desired effect. You can get them online or at your local home improvement store. After pouring paint into your paint tray with a liner, roll your roller in the paint and then roll it on the upper part of the liner to wipe off the excess paint. You don’t want it to be really full and dripping. Next, climb up on your stool or ladder so you are high enough to hold the drywall knife with the edge of the blade right in the corner, protecting the ceiling. Now roll the roller along the top edge of the wall with the plastic end of the roller cover touching the drywall blade. Continue moving the blade along the corner and refilling your roller as needed until you’ve edged the entire wall. And there you have it- a straight line! Simple as that. Two pieces of advice: Be sure to check which side of the blade you are putting against the ceiling when you return after refilling your roller. You don’t want to mistakenly put the side that will have a little paint on it from your roller up against the ceiling. And don’t go heavy with the paint. In all your painting, you will always need to do two coats if you want a really even, nice looking finish. So, go light on your first coat to avoid drip lines or, with the ceiling edge, to avoid having so much paint on the roller that it leaks behind the drywall blade. You can use this same technique to do the edges that run along base trim or door trim if you are lazy like me and hate taping off. Good luck and happy painting!